Imagine being an archaeologist exploring ancient shrines in Egypt and stumbling upon this 3,245-year-old unbroken seal. Such was the sight that greeted Howard Carter in 1923 as he prepared to enter King Tut's astounding shrine for the first time. This incredible photograph was taken by Harry Burton in 1923. 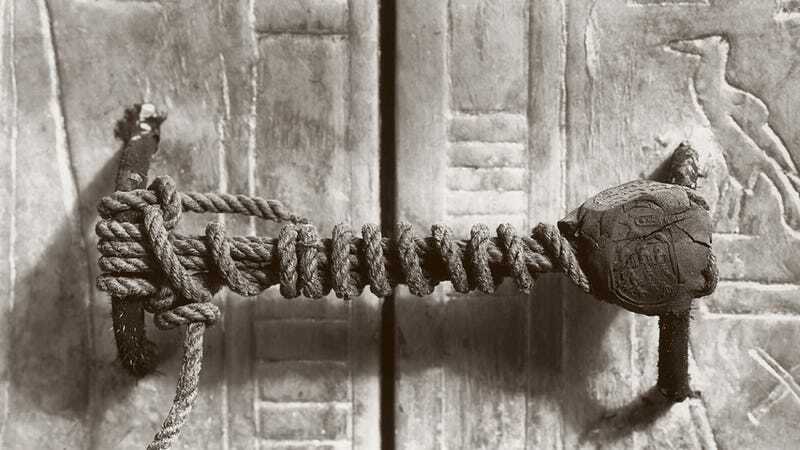 It shows a still-intact seal made from rope securing the doors to the second of four nested shrines in Tutankhamun's tomb. The necropolis seal depicts captives on their knees, and Annubis, the jackal god of the dead. King Tut's outermost shrine was opened and looted twice during ancient times, but the doors of the second of the huge shrines of gilded wood containing the royal sarcophagus still carried the uncompromised seal — an indication that the contents were untouched and intact. The door was eventually opened by the famous archaeologist and Egyptologist Howard Carter, leading to the discovery of a spectacular trove of ancient treasures. Rope is one of the fundamental human technologies. Archaeologists have found two-ply ropes going back 28,000 years. Egyptians were the first documented civilization to use specialized tools to make rope. One key why the rope lasted so long wasn't the rope itself, it was the aridity of the air in the desert. It dries out and preserves things. Another key is oxygen deprivation. Tombs are sealed to the outside. Bacteria can break things down as long as they have oxygen, but then they effectively suffocate. It's not uncommon to find rope, wooden carvings, cloth, organic dyes, etc. in Egyptian pyramids and tombs that wouldn't have survived elsewhere in the world. Egypt's desert conditions made possible the preservation of far more organic material than would have otherwise been the case. This in contrast to, say, Maya sites in Central America which are far younger, but from which almost no organic material has been recovered. The main difference is jungle vs desert conditions. The photo, which somehow didn't make it into National Geographic's original coverage of the dig, was finally released to the public in 2003. Photograph by Harry Burton, Griffith Institute, Oxford 1923.